There seems to be a new trend cropping up in finding good cosmetic brushes -- shop at an art supply store. It is true that one can find superior quality cosmetic brushes in the art stores, because many art brushes are made by the same manufacturers who make cosmetic brushes. For example, FM Brush Company, Inc., Dynasty's parent company, also creates the brushes for Beauty Strokes. Since brushes of this high quality hair type and fine use are similar to manufacture, it only makes sense. So the question is, can one interchange the brushes? Paint Brush or Cosmetic Brush? Cosmetic brushes are often made with goat hair, soft black mops that hold light pigment and mica powders for easy application. There are plenty of filbert shaped contour brushes and foundation brushes as well, often made from synthetics or even Kolinsky sable hair. The brushes will likely have very different handles than what is sold in the art stores, but the tufts will be very similar, if not the same in shapes and hair quality. Sizes will vary in each. Large mops and small filberts work well for cosmetics, as well as some very different shapes and ovals for foundations, blending, etc. Artists have different needs for their applications, so the size differences make sense based on the type of art. Whether the brushes are completely interchangeable is up to each individual. Applying makeup is another art in itself and each artist needs to choose what works best for him or her; however, it is good to have options whether you're shopping at an art supply store or at the cosmetic counter. New Jersey artist, Joe Gyurcsak is an active plein air and studio artist with gallery representation, ongoing demonstrations and workshops around the country and a full time job as the Resident artist, Brand manager, Art Education and Technical Director for Utrecht Art Supplies. His work is all art all the time, so Joe knows art materials well, and it has paid off in his own painting career. A few years back Joe switched from working in oils to acrylics, finding the medium more suitable for his evolving style-- laying the paint on quickly and somewhat sporadically. Even in the plein air work Joe does, the fast drying time of acrylic paints don't impede Joe; if anything, they encourage him to make the strokes he intends and move quickly. 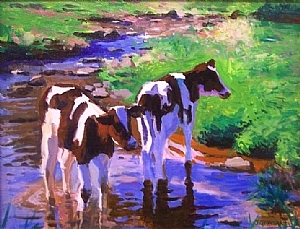 In painting with acrylics, Joe advises artists to use stiff synthetic brushes as they move paint well. 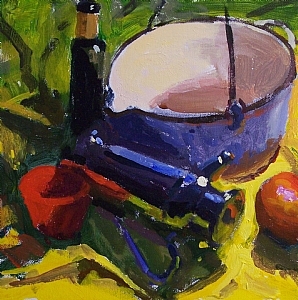 For most of his work, Joe uses flats and filberts in rather large sizes because they offer broad open strokes. As he layers the paint refining the passages, he allows each layer to hold some of its own color and substance to show through. Recently, Joe tested some Dynasty wave brushes and found that they were perfect for his technique, giving him the ability to lay down different amounts of paint in the same stroke. "They are great for uneven distribution of paint and unique application of paint because of the way they are cut. 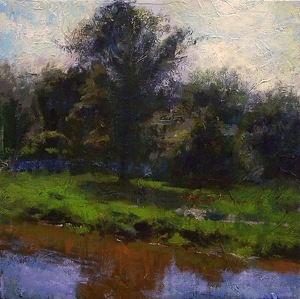 [Ideal] for using with acrylic and landscape painting for varied texture," he explains. With acrylics an artist doesn't have time to mix the paint with a palette knife creating the exact hues. "Mixing is best," Joe says, "when it is done with the brushes themselves during the painting, which then also gives the work a liveliness of color and irregular brushstroke." Joe will be doing demonstrations and workshops around the country this year on his switch to acrylics and painting still life. He will be at the Bethlehem Palette Club on May 4th doing a workshop on still life painting. For a better understanding of plein air work and walk through an online demo with Joe, tune in to Utrecht's own website: Painting a Plein Air Still Life. To see more of Joe's work in person, visit one of his two galleris, The William Ris Gallery in Stone Harbor, New Jersey or the Eisele Gallery in Cincinnati, Ohio.